BEIJING — A rap group backed by China's government is warning South Korea in a music video that "you're going too far" with the deployment of a U.S. missile defense system, as Beijing seeks to bring its state-supported cultural forces to bear in the international dispute. A member of the group CD REV said government officials worked with them on the video and helped to promote it on foreign websites, many of which are blocked in China by official censors emboldened by the ruling Communist Party's warnings against foreign "cultural infiltration." 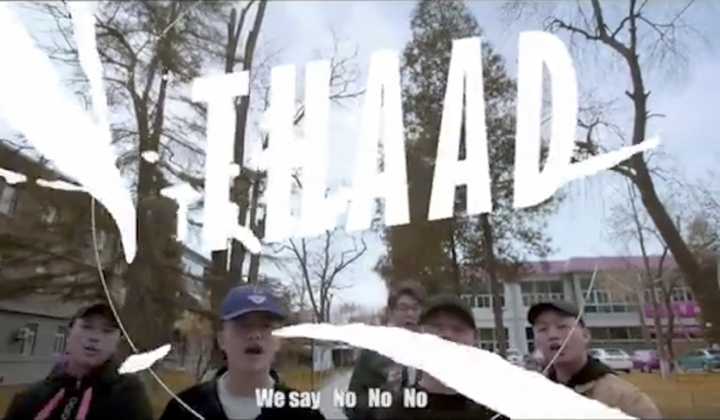 In the song, group members chant that "about THAAD we say no, no, no," a reference to the U.S. Army's missile defense system formally known as Terminal High Altitude Area Defense. Later in the song, they refer to South Korea, saying, "this time, kid, you're going too far" and "your big brother's annoyed," a nod to China's view of itself as the pre-eminent political and economic power in northeast Asia. Beijing vehemently opposes the missile shield, saying its powerful radar will allow it to monitor missile launches, aircraft flights and other sensitive activities in northeastern China. South Korea and the U.S. say it is necessary to guard against North Korea's missile and nuclear weapons activities that threaten South Korea, Japan, U.S. territories and possibly even the continental United States. CD REV's Wang Zixin told The Associated Press that the group hopes to rally Chinese worldwide against the deployment of THAAD and demonstrate China's "tough stance" on the issue. "We would see government reports and comments, but at the same time, we see the whole event from the position of Chinese," Wang said. In the video, the group also takes shots at what Wang referred to as "vulgar behavior" within China, such as vandalism against South Korean-made Hyundai vehicles. The video — viewed by Wednesday more than 300,000 times on Facebook and Twitter and almost 2.7 million times on the Chinese video-posting site Maiopai — represents the latest example of China's use of non-diplomatic channels to broadcast its displeasure with South Korea. Last year, there were reports that China had stopped giving approval to performers of Korean pop music, or "K-pop," to play shows in China, on the heels of Seoul signing the agreement to host THAAD. In March, South Korean officials voiced concerns that Beijing was limiting tourism to their country as an unofficial sanction. South Korean retailer Lotte, which provided the land for the THAAD deployment, has also been boycotted by Chinese customers and seen construction halted on an amusement park it was building in northeastern China. Such moves underscore a willingness on the part of China's Communist Party leaders to fan the flames of anti-South Korea sentiment, said Korea expert Sung-Yoon Lee of Tufts University in Massachusetts. "THAAD retaliation is a Chinese government-engineered project," Lee said. "It can be controlled and reversed by Beijing. ... The Chinese public has no interest in the complexities of missile defense systems." South Korea's foreign ministry did not immediately respond to questions about the song, and the video did not appear to garner much attention on the country's social media platforms. During a phone call with Chinese President Xi Jinping last week, South Korea's new president, Moon Jae-in, said he was aware of Chinese worries about THAAD and asked Xi to help resolve difficulties facing South Korean businesses operating in China. A special envoy representing Moon is due to visit China on Thursday for talks on THAAD and the overall bilateral relationship.